When you are ready to take your outdoor lifestyle to a new level of enjoyment, we recommend well built, long-lasting, ultra-low maintenance composite decks for Warrenton, VA, homeowners. Over the past decade innovative advances in materials science have brought new life to outdoor construction projects built with quality composite materials from manufacturers including Trex, Fiberon, and TimberTech. Remember when we spent more time, it seemed, cleaning, scraping, painting, repairing, sealing, and protecting our little wooden decks. Now we have attractive options. Affordable and attractive on many levels, composite decks offer Warrenton, VA, homeowners a maintenance free deck impervious to rain, snow and the relentless burn of the sun. Composite materials are also resistant to insects, splintering, rot, and deck surface damage. Maintaining composite decks is nice and easy. Sweep debris. Periodically clean with soap and water or, if you prefer, composite decks in Warrenton can also be effectively cleaned with a pressure washer. That’s it. When shopping for composite decks, Warrenton, VA, residents should place a quality deck contractor at the top of their list. The best composite materials in the world will perform properly if properly designed and installed. 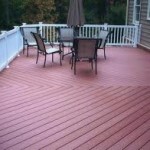 Before you select materials, site your new deck, or buy your furniture, call the deck installation experts at Hal Co. With almost 40 years of deck construction under our belts, we have the tools, techniques, and technology to deliver affordable, high-quality composite decks for Warrenton, VA, homeowners. Family-owned and operated, we take great care in constructing composite decks in Warrenton and throughout Northern Virginia that our family creates with pride. When you’re ready to treat family and friends to the comforts of gracious outdoor living in your own back yard, call the deck professionals at Hal Co for quality composite decks in Warrenton, VA.